When Roisin & Liam attended a villa wedding in Spain as guests, they both knew immediately that this was exactly the style of wedding they wanted. Roisin and Liam both wanted to have a religious legal wedding in Spain and the team at Sunshine Weddings Spain guided them through the process. First they needed to find a church near to their chosen villa wedding venue in Spain near Marbella, and a priest who would be willing to marry them. As they met the main criteria to have a religious legal wedding in Spain due to the bridal couple both practising as Catholic’s the priest was happy to perform their wedding ceremony in Spain although a little surprised that an Irish bride wanted to have her wedding in Spain. And so the church, which was located in a white washed Andalusian village (pueblo), was booked, and Roisin could sit back and relax in Ireland whilst the Sunshine Weddings Spain team began to plan her wedding in Spain. The introduction of a Spanish translator, originally born in Ireland, was booked for the religious legal wedding ceremony in Spain to prompt key moments so their Spanish themed wedding was maintained throughout. 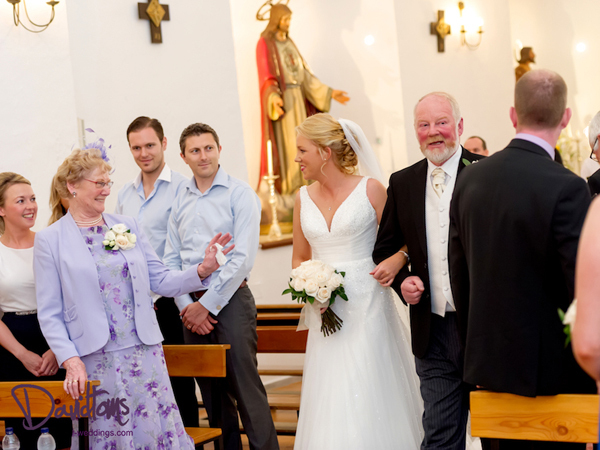 Locals clapped and cheered as Roisin and Liam led the way from the church to the tapas bar in the local square and all the guests drank and enjoyed the September Spanish sunshine. Shortly afterwards, guests were taken to the villa wedding venue in Spain, located in a private location and surrounded by the national park. This Villa Wedding Venue in Spain was specially chosen to ensure that their fun would not disturb any neighbours for Liam & Roisin’s special wedding in Spain. As guests were treated to drinks and canapes by the pool area they enjoyed the relaxing sound of running water from the stream close by. Then they were led to a newly grassed area of the property where guests could dine outside under the stars. Following a delicious meal, and just as the sun was setting, guests were led back to the main area of this villa wedding venue in Spain ready for the main party to begin. Riosin and Liam embraced their first dance which began the nights music and dancing which went on until the sunrise. For this bridal couple their expectations of their perfect wedding in Spain were surpassed and their requirements for a fun and joyous wedding in Spain were met. Their wedding celebrations didn’t just finish when the sun came up, they provided a fantastic BBQ spread, the following afternoon, by the pool for all their guests. The festivities kept on going as they had booked their wedding villa in Spain for 4 days in total making this a real wedding in Spain to remember.